As a native Pennsylvanian, I hate to say this: Our state is about as bad as it gets when it comes to pollution. Our state alone generates about 1% of the world’s entire carbon dioxide emissions. Our electricity sector alone generates 0.34% of the world’s emissions. Yet we are home to just 0.18% of the world’s population. Per person, we are five times as bad as the rest of the world from a carbon perspective. And our impact is the worst locally. Our air is not clean. 23% of the children in Philadelphia today have asthma, according to the Physicians for Social Responsibility report, Coal’s Assault on Human Health. Say what you want about China’s rapacious development of new coal generation; however keep this in mind when you do: We have 28 coal plants in PA. We have a hundred years of dirty coal generation behind us, and we need to start making up for it. 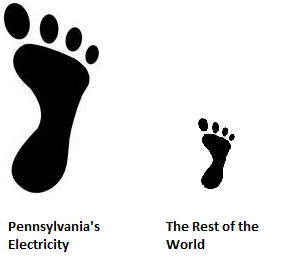 And therein lies the silver lining: Clean energy makes a bigger difference in PA than elsewhere. Since our generation is so dirty in comparison to other places, it means that every bit of electricity we generate through renewable energy in Pennsylvania counts even more than it does in other states. A recent study by Carnegie Mellon University drove this point home, demonstrating that Eastern states give you the most environmental bang for your buck for solar and wind projects because they replace the dirtiest energy generation. The study can be found here. We are ground zero for climate change and adverse public health impacts, but each and every one of us can make a difference here by choosing wind and solar in Pennsylvania.